Welcome to the Year one class page. You can find out all about our learning and topics by clicking on the curriculum letter link. Well done to two Year 1 pupils who have successfully discontinued their Reading Recovery programme. The children have worked intensively on their reading and writing skills and are very proud of their achievements! The final part of our IPC topic - making and eating our own healthy popsicles. The children really enjoyed making their popsicles and getting to choose which fruits they wanted. Even though they were not completely frozen by the end of the day (we found out fruits take longer to freeze than water), they still really enoyed eating them the end of the day. Today we performed our class assembly to the school. We have been learning about solids, liquids and gases in IPC this term; this performance shows everything we have learnt so far. The children worked very hard and practise many times to get their performance right. They did an incredible job, we are very proud of them. We had a special guest visit us today to talk about road safety. He did lots of amazing tricks to show us how to cross the road safely. 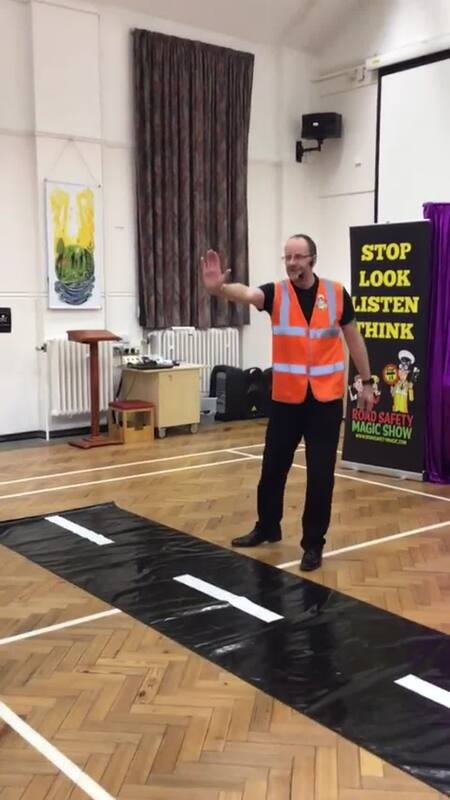 We are now official road safety magician assistants and know when it is safe to cross the road. Today we had our final football lesson for this term. All the children really enjoyed and improved their skills. Today we had some special visitors visit us at school. They were performing their Beauty and the Beast pantomime. We really enjoyed it! Here are some photos of the performance. I have told the children about these photos, see if they can tell you about what is happening in the photos so you can experience it too. For our IPC topic ‘Who Am I’ we were learning how to draw a self-portrait. We worked really hard on these and hope you enjoy.